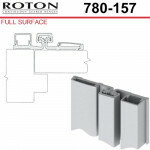 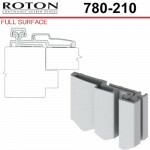 780-157 Roton Full Surface - Narrow or Inset Frame For Retrofit - Templated Continuous Geared Hinge 83"
Roton 780-157 Full Surface 83", Narrow or Inset Frame for Retrofit, Templated Continuous Geared Hing..
780-210 Roton Full Surface - Retrofit - Swing Clear Action - Templated Continuous Geared Hinge 83"
Roton 780-210 Full Surface 83", Retrofit, Swing Clear Action, Templated Continuous Geared Hinge. 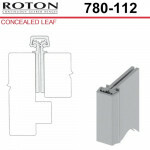 ..
Roton 780-157HD Heavy Duty Full Surface, Narrow or Inset Frame for Retrofit, Templated Continuous Ge..
780-224 Roton Concealed Leaf - 1-3/4" Doors - Templated Continuous Geared Hinge 83"
Roton 780-224 Concealed Leaf, 1-3/4” Doors, Templated Continuous Geared Hinge for 83" doors. 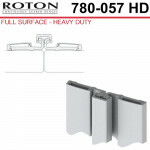 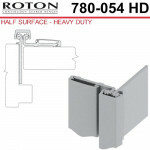 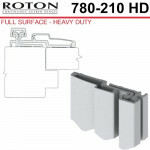 Rot..
780-054HD Roton Half Surface Continuous Geared Hinge 83"
Roton 780-054HD Heavy Duty Half Surface 83" Continuous Geared Hinge. 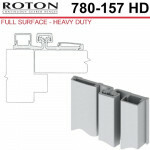 Roton catalog ..
780-057HD Roton Full Surface - Bi-Fold Applications Continuous Geared Hinge 83"
Roton 780-057HD Heavy Duty Full Surface 83", Bi-Fold Applications Continuous Geared Hinge. 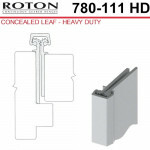 Roton..
780-111HD Roton Concealed Leaf - Entry Door For 1/8" Inset - Templated Continuous Geared Hinge 83"
Roton 780-111HD Heavy Duty 83" Concealed Leaf, Entry Door for 1/8” Inset, Templated Continuous Geare..
780-112 Roton Concealed Leaf - Entry Door - 1 3/4" Doors - Templated Continuous Geared Hinge 83"
Roton 780-112 Concealed Leaf 83", Entry Door, 1-3/4” Doors, Templated Continuous Geared Hinge. R..
780-112 Roton Concealed Leaf - Entry Door - 1 3/4" Doors - Templated Continuous Geared Hinge 95"
Roton 780-112 Concealed Leaf 95", Entry Door, 1-3/4” Doors, Templated Continuous Geared Hinge. 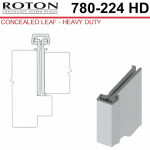 R..
780-112HD Roton Concealed Leaf - Entry Door - 1-3/4" Doors - Templated Continuous Geared Hinge 83"
Roton 780-112HD Heavy Duty Concealed Leaf 83", Entry Door, 1-3/4” Doors, Templated Continuous Geared..
780-112HD Roton Concealed Leaf - Entry Door - 1-3/4" Doors - Templated Continuous Geared Hinge 95"
Roton 780-112HD Heavy Duty 95" Concealed Leaf, Entry Door, 1-3/4” Doors, Templated Continuous Geared..
780-157 Roton Full Surface - Narrow or Inset Frame For Retrofit - Templated Continuous Geared Hinge 95"
Roton 780-157 Full Surface 95", Narrow or Inset Frame for Retrofit, Templated Continuous Geared Hing..
780-210 Roton Full Surface - Retrofit - Swing Clear Action - Templated Continuous Geared Hinge 95"
Roton 780-210 Full Surface 95", Retrofit, Swing Clear Action, Templated Continuous Geared Hinge..
Roton 780-210HD Heavy Duty Full Surface, Retrofit, Swing Clear Action, Templated Continuous Geared H..
780-224HD Roton Concealed Leaf - 1-3/4" Doors - Templated Continuous Geared Hinge 83"
780-224HD Roton Concealed Leaf - 1-3/4" Doors - Templated Continuous Geared Hinge 95"